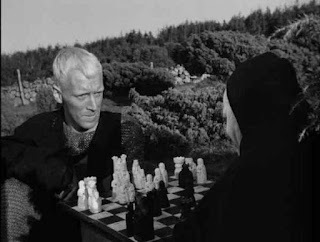 As it turns out, there isn’t a chess scene as such in The Seventh Seal. Chess is not a simple plot device (Blade Runner; Saturn 3), it’s not used for characterisation (The Thing) and it’s not there to provide a moment of comic relief (Spice World; Star Wars). Our game is the very spine of Ingmar Bergman’s story. We start with two guys lying on a beach. They’ve got horses, but it’s clear that they’re not going anywhere any time soon. Why? 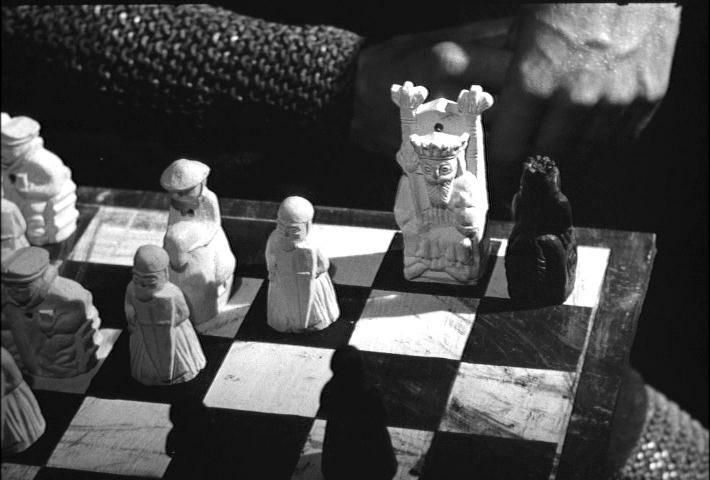 Because there’s a chess set, the time honoured signal that the people that you’re seeing on screen have a lot of time on the hands (see Cggtm's 2001, Spectre, The Hateful Eight & Bridge of Spies for instance, as well as Triple 9 which is currently playing at your local cinema). Our man - the Knight - isn’t ready to pop off just yet, though. He proposes that they play a game of chess. The condition is I live as long as I resist you. If I conquer you, you free me. For no adequately explored reason, Death agrees. Neither is it explained why the game is to be played a few moves at a time for that matter. Still, as the Knight goes about his business we do at least find out why he wants to play. After 10 years away on a a Crusade he's lost his faith in God. He’s struggling to understand the purpose of his life and he wants the extra time to allow him to do "one meaningful act". If only he can discover what it should be. Anyhoo, what of the chess? Sad to say, there’s not much there for the aficionado. The two-pieces-behind-your-back-to-choose-colours bit is a nice touch. After that, though, things rather go downhill. At one point Death - who turns out to be a bit of a knob - impersonates a priest to trick his opponent into giving away his strategy for their game. "I’m playing a combination of bishop and knight that he hasn’t noticed yet," the Knight says. "I’ll expose his flank in the next move." That’s not exactly the sort of dialogue that convinces you that Bergman was One Of Us, is it? And then there's the game itself. The fact that Death leaves his king hanging around the centre until deep into the middle game suggests that his claim to be, "quite a skillful chess player" is wishful thinking on either his or Ingmar’s part. 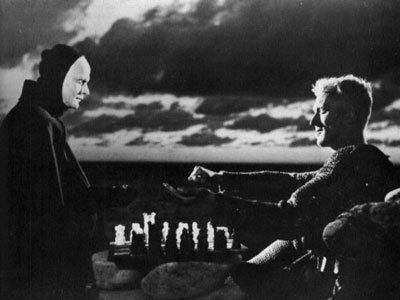 The Seventh Seal is 60 years old now. That puts it as far away from us as it is from the very first films (e,g.). It’s entertainment from another time and it looks it. And yet, dodgy chess, ropey acting and an almost complete absence of anything that might be thought of as action, somehow it’s still well worth a look. I like the ending if nothing else. The Knight, knowing he’s about to be checkmated, knocks over the pieces. He’s not trying to save himself. He's distracting Death to save a family of jesters he befriended on his way home. Just Like MacReady from The Thing, the Knight loses in the end as he inevitably must, but he loses in style. He loses on his own terms. Our man, with the help of chess, found his meaningful act.